Welcome to another weekly recap on your favorite blog! How are you? 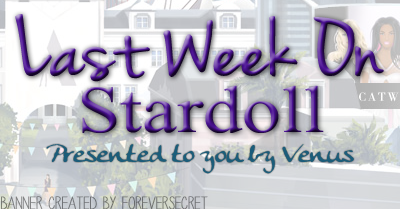 Did you enjoy previous week on Stardoll? Honestly, I was expecting more. I am sure Stardoll knows about our wishes for updated closet for our medolls, and I am pretty sure they are working on it. I hope we get that update soon, or anything to inspire me to spend some money on the game. But enough about that, here goes the recap. The week on Stardoll started with a new release in Film Theory store, inspired by infamous books and movies The Hunger Games. I am really happy and satisfied with this release, as, honestly, it can be boring dressing your doll in 'ordinary' clothes, having 'ordinary' suite. My favorite item are, of course, the wings, which are superstar only, of course, but they are my fist thing to buy once I renew my ss membership. I am also loving Katniss Fire Dress, Effie Pink Dress, the Mockingjay sign, Katniss hairstyle, (which doesn't look that well on my doll though), and of course, the fab interiors. Like I said, I am supper happy with the release, as I adore books and movies. I was surprised that there was a fair amount of people saying they did not like books/movies, but people are different, have different tastes, and it is totally normal thing. I am hoping for more themed releases, maybe get inspired by some TV show, like Charmed, Arrow or The Vampire Diaries. Like I mentioned in previous paragraph, I love themed stuff. I love the unique, maybe even weird looks. (I mean, look at those purple and green aliens.) I also love the lightsabers (Huge Star Wars fan here! ), and that dark grey robe. I wish we got more Star Wars inspired stuff though. Interiors? Beyond amazing! Now if we could only have more 'ordinary' rooms, I wouldn't object paying for those. Anyway, there are other cool outfits and wigs. I may be slightly annoyed that the previous collection went without warning, but when I think it through, we had few sales on this store, and more than enough time to buy stuff. On Thursday, Stardoll announced 50% off closing sale on Roots and Design for a Better World. Seems like Stardoll keeps 'decluttering' their stores, maybe making rooms for some new ones. It is nice that we are getting not only the warning, but a pretty good deals as well. I am okay with clothing stores leaving plaza, you buy what you want. But about decor stores, it can be a bit tricky. You may think you don't need certain stuff at the time, but regret it later. Decor is a bit harder to find in bazaar, but of course, you can always use some alternatives in case you think you are missing a certain piece. Okay, if Stardoll keeps removing stores, or at least some older stuff, what do you think is/are next one(s) to go? The same day, we got a new offer by Stardoll - 15% extra stardollars for Superstar membership top up. Hm.. long time no offers, and we get this? No offense, but seriously? Sure, it is nice incentive for people who were already planning to renew their ss membership, and for people buying bigger packages. But for users that don't want to pay much money for an online game, not so appealing offer. I would have preferred some clothes, hairstyles, or how about that wardrobe update? If they added it and made it ss/royalty only, or if Stardoll brought back starcoins to stardollars exchange, or make starcoin stuff sellable for stardollars as well, stuff like that, - I'd update it in a heartbeat. Seriously, we need more updates, not just in layout. But I guess we need to be patient. And on Friday, we got new release in Mawi jewelery store. I love the Mawi store, mostly because of the unique, out of ordinary jewelry, bold colors and interesting shapes. Necklaces are great, but I am not a huge fan of bracelets and rings, as they can be barely visible, yet go over your clothes sometimes when you don't want it to. Prices are okay, but what's with all those Easter bunnies? I'd prefer a simple, ordinary layout, instead of robots and bunnies. But I guess out-of-ordinarty store deserves an out-of-ordinary layout. That sums up the week. We have no idea yet what can we expect for tomorrow, but I hope it is not a limited store, as I am non superstar member and kinda low on stardollars. Maybe new Young Hollywood collection? No idea, like I said. Now vote, and see you next week on the same place.